Time Warner Cable and Cox suffered widepread outages Monday. A cable cut accidentally by "third party construction" caused a massive outage for TV, phone and Internet customers in the Northeast. The outages affected customers of Time Warner Cable and Cox in the New York City area, Connecticut, Rhode Island and Massachusetts, DownDetector.com. People began reporting service disruptions around 2:45 p.m. ET, and complaints were still rolling in hours later. Time Warner Cable (TWC) said in a statement that "multiple fiber cuts at one of our network providers" were the source of the problem. Level 3, a company that provides infrastructure and wiring for cable companies, confirmed to CNNMoney that it was experiencing problems. "Our network is experiencing service disruptions affecting some of our customers with operations in the Northeastern United States due to a fiber cut caused by third-party construction. Our technicians are on site and working to restore service," Level 3 said in a statement. Level 3 has deals with Time Warner Cable and Cox. It's unclear if other Level 3 partners in the Northeast were affected. It said service had been restored to all New York City customers by 9 p.m. Neither TWC, which covers much of the New York City region, nor Cox, which has customers throughout Connecticut, Massachusetts and Rhode Island, could say how many of their customers lost service. Businesses that rely on Internet and phone service to operate struggled to cope with the outages. Broadcast TV channels were not affected, but New York City's NY1 News station dealt with hours of interruptions. NY1 is back on for #NYC Time Warner Cable subscribers with a cable box. TWC is still working to restore all services affected by the outage. Ed Debari, the manager of Sunnyside Pizza in Queens, New York, said his phones went quiet around 2:45 p.m., shutting off orders. Customers who came into his shop were unable to pay with credit cards. "We are losing tons of money. If we didn't have a busy morning, it would be a disaster," Dibari told CNNMoney. Dibari realized that service was restored to his pizza shop when his phone started ringing again about 6:45 p.m., four hours after it went down. Moments later his credit card service was restored. Dibari estimated the outage cost him about $300. Widespread outages appeared to continue, however, through the evening, according to DownDetector.com. 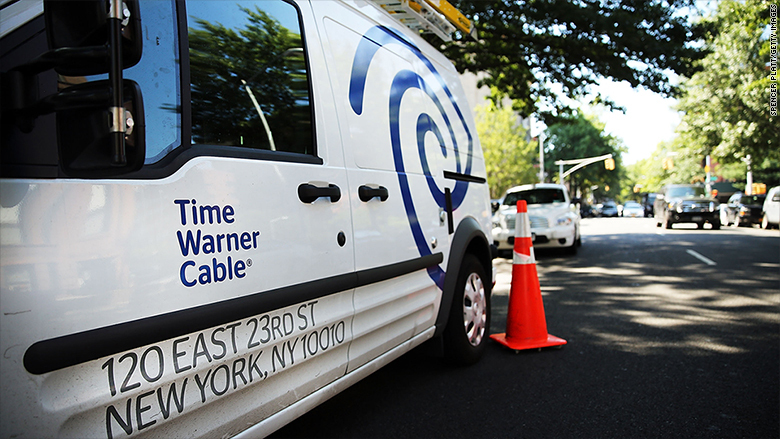 The service disruption comes weeks after the Justice Department approved a $78 billion takeover of Time Warner Cable by Charter Communications. The deal has been in the works for almost a year. It is expected to take effect later this month. Charter is awaiting one final approval from a utilities board in California. Once that happens, Charter will formally introduce itself to millions of Time Warner Cable customers, and it will retire the Time Warner Cable name.